I am QRV IOTA contest. Please check QRZ.COM for detail. Pista HA5AO will arrive eSwatini (Swaziland) on 14 September, late afternoon. He plans to operate during his free time between 16 - 28 September from the Mountain Inn Resort at Mbabane. He received the 3DA0AO license and an LotW certificate. Pista will operate 80 – 10 meters using a Hustler 6 BTV vertical antenna with 17 and 12 meter add-on elements, CW, RTTY and FT8. He is bringing an Elecraft K3 with the KPA 500 amplifier. Logsearch will be available on HA5AO.com. His plans include testing a new feature of the PDXG QSL Management Platform (M0OXO OQRS/Logsearch), the uploading of QSOs in real time. While in-country he will travel to rural areas visiting villages, schools and orphanages to deliver school supplies to orphaned children. He is interested in making a long term donation agreement to pay school fees for several orphaned children. Pista is paying all expenses from personal funds. However he would appreciate donations through his website. Any donations received will be used only for humanitarian purposes. 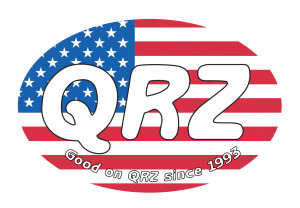 Here at QRZ.com we are incredibly excited to celebrate our 25th year of providing a reliable amateur radio database to the world-wide Ham community. Since our founding in 1993, we've seen a lot change in the world and in the hobby. Just to give you some context: If the internet were a family, we'd be Amazon (1994) and Yahoo's (1995) big brother, Google's (1996) cool older cousin and Wikipedia (2001) and Facebook's (2003) grandpa! Over the years we've prided ourselves on bringing you new and innovative features like XML data, the QRZ logbook, and QRZ operating awards. And we have no plans to stop any time soon! We appreciate each and every one of our users and subscribers and we want to thank you for your loyalty and for the trust you've placed in us over the years. 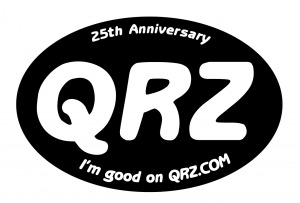 To celebrate, we are offering two 25th Anniversary designs of our "Good on QRZ" sticker. The sticker of your choice is FREE to anyone who sends a business sized, self addressed, stamped envelope to us here at QRZ. If no selection is made we'll assume "dealer's choice" and pick one for you. Keep an eye out for more upcoming announcements of our 25th anniversary celebration, including a special 25th Anniversary QRZ Operating award! Thanks again from the whole team here at QRZ! The Team will be operating once again as ZS9V from Robben Island (IOTA group AF-064) from the evening of 17 August until sometime on Monday 20 August. This is the weekend of ILLW. (NOT the IOTA Contest weekend). Same as last year (SSB on 10/15/20 and SSB on 40/80). New this year will be our CW station. Further information on the operation will be published on zs9v.org.za and M0OXO.com as it becomes available. M0OXO will have contact with the team should any areas be experiencing difficulties (such as VK) so please contact him if you need 'special attention'. One of the most popular Contests of the year is on the horizon and takes place between 12:00 - 12:00 UTC 28th - 29th July 2018. Take, JI3DST will be active from Shodo (小豆島) Island, IOTA AS-200, 16 - 18 June 2018, as JI3DST/5. He will operate on 40 - 6m CW, SSB. QSL via home call buro preferred, ClubLog OQRS. VI70MI is a Special Callsign issued to Commemorate 70 years of ANARE (Australian National Antarctic Research Expeditions) for Macquarie Island, which since 1947 have served Australia in the south polar regions. The first ANARE Expedition to Macquarie Island was in March 1947. All HF bands 160m-10m, SSB, CW, RTTY and possibly digital modes also. VI70MIwill be joining the WAP World Antarctic Program and we are awaiting a WAP allocation. Chris Dimitrijevic VK3FY currently qrv from UA4M Contest Station whilst visiting Russia for the World Cup. The first log for the EI DX Groups operations has now been received and is available on M0OXO OQRS. This particular log refers to EU-115, the Irish Main Island. OQRS is open for requests but QSL Cards for this event won't be sent until after the final activation at DX Feile on the Aran Islands (EU-006) in September. . Listen out for the other stations qrv over the next few weeks from all of the Irish IOTA Groups. The next activation will be Little Saltee island EU-103 on the 15, 16, 17 & 18th june 2018. Please familiarise yourself with the award available for working all the irish IOTA's by checking their website on the link below. Harald (DF2WO) will be qrv from Kigali, Rwanda later today. He will be using various antennas and he hopes this new location will giove him less noise and a far better take off than he has had in previous visits. Listen for Harald on CW (slow), SSB and Digital Modes (FT8 etc). Just a reminder that emails and busted call enquiries will be delayed this week. I am attending the Ham Radio Fair in Friedrichshafen and will be travelling between 0300 Thursday the 31st May and not returning home until Tuesday the 5th of June. All Busted Calls and Direct QSL requests have been completed and cards sent up to 0700 today so please be patient if you submit an enquiry during this period as it may not be answered as fast as usual. Many of you can rememer the RI0B callsign sounding back in 2001 from Ushakova Island. Our team has decided to give this callsign a second breath. Moreover, one of our current team members (Andy Moiseev UA0BA) was the member of the old “Lost Islands” expedition too. And so after his suggestion and blessing we’ve taken the same callsign RI0B for our new expedition again. Our new expedition 'Arctic legends 2018' will take place in September this year. The IOTA Shop is now on-line and can be found on the IOTA Website. ''This 18th edition contains the complete listing of IOTA islands as well as everything you need to know to participate in IOTA. Included in the colour section are fascinating reports on several rare IOTA operations from Ashmore Reef, an Australian external territory in a highly sensitive area of the Timor Sea, Bhola Island and St Martin’s Island, two Bangladeshi islands in different IOTA groups, Pukapuka Atoll in the North Cooks, Busuanga Island in the Philippines and Mokil Island in the Federated States of Micronesia. For those of you attending Ham Radio Event in Messe Friedrichshafen next week, don't forget to call in at the Mediterranean DX Club (MDXC) Booth where you will be welcomed by the team on site. There will be beer, Wine, 'New Gadgets' and some Special Sausage available on the stand plus a wide range of MDXC bits and bobs. There will be also be the facility to make yourself a member of MDXC and all of the benefits that go with it. You will also be able to meet Team Members from the upcoming Z23MD Dxpedition to Zimbabwe. Lets see you there, have fun and safe travels to all de MDXC ! ''HAM RADIO serves as a platform where radio enthusiasts can get together and exchange information and experience. As one of the largest amateur radio exhibitions in the world, alongside the Hamvention Dayton/Ohio, USA and the Ham Fair in Tokyo/Japan, HAM RADIO attracts exhibitors and visitors from more than 32 countries all round the world to Friedrichshafen. A special feature of HAM is the combination of commercial exhibitors, worldwide networked associations and Europe’s largest radio flea market with some 280 participants from 16 countries. Using the 'Echo Juliet' prefix, EJ0DXG will be QRV from IOTA EU-006, EU-007, EU-103 and EU-121 this summer. Starting off with 'Little Saltee Island' EU-103 on June 15/16/17/18th....the groups will be QRV on HF and 6m bands using CW, SSB and Digital modes. Supported by dxwanted.net a beautiful plaque will be available for whoever works them on 4 different IOTA Groups. So, as a 'Bonus' or 'Joker' station, EI0DXG will also be QRV from Mainland Ireland (EU-115) throughout and until September 30th 2018. As with all EIDXG activities, please QSL via M0OXO.